The LSI LASTEM direct output thermohygrometer type uses an RH% and air temperature sensor. In case of outdoor applications, this must be paired with the radiant screen. Reliable and precise, the thermohygrometer sensor is also suitable for continuous measurements and in harsh environments. It is also suitable for use in the presence of a hygrometric and steep thermal variations. The LSI LASTEM Thermohygrometer (direct output) is available in 2 models - DMA672.1 and ESU403.1. The power supply range and output is same for both the models, but it varies in connector and data logger compatibility. The DMA672.1 uses M-log, E-log and R-log for data logger compatibility and the length of the connector is 3m. When it comes to ESU403.1, it uses only M-log and R-log for the data logger compatibility and the length of the connector is 3m & N.2 as a mini DIN connector. 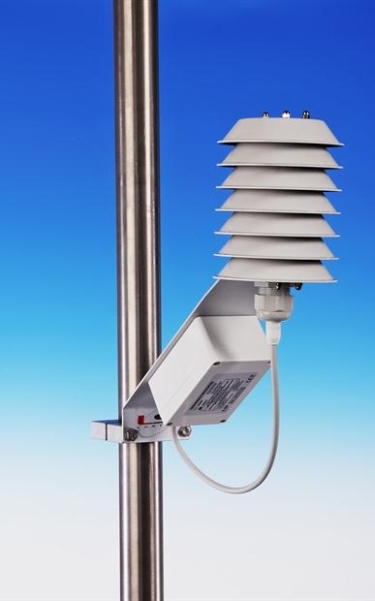 The protection type of the LSI LASTEM Thermohygrometer (direct output) is IP54 and the operating temperature is -40 to 80 degree C.
Accessories include a ventilation radiant screen, ISO9000 type RH and temperature calibration, mast mounting device and the multi plate type natural ventilation screen for the DYA046 arm. LSI LASTEM's Thermohygrometer (analog, RS485 output) is an instrument used to measure the accurate readings and measurements of relative humidity and air temperature in the very severe outdoor environment. On the DMA980, DMA975 and DMA875 models, the natural, high efficiency ventilation radiant screen (with special black paint on the plate surface) ensures that the sensing element is protected from the sun rays for an accurate reading of air temperature. For the better result in high solar radiation and low solar radiation condition, the DMA867 model is well equipped with the forced ventilation screen. All the models will work on the common temperature and relative humidity are the same. The accessories needed for this thermohygrometer includes a calibration certificate, mast mounting device, cable, sensitive element and 7 pin free female connector. The protection type used in this is IP65 and the electric protections are emifilter and tranzorb. The operative temperature varies between -40 to 80 degree C. The output for the programmable hydrometric for all the models is dew point or RH% only.